I think it would look fantastic on the brickwork between the toilets and the minicab firm outside the station or on the upper corner part of the building above where the small signinage for all the shops to the station (bobs, outback, shapers etc) is. It would give a vibrant and lovely welcome to Sydenham!! The third question I guess comes to mind is if this would cost £2000 or more, would people feel a crowdfunder of this value be more useful in other ways?! Bit of an open one really but be nice to know what people think! I'd be positive about it and would happily contribute to a fundraising effort. FH are putting the Walrus in it, and Catford have the greyhounds on the bridge - what could we have that represented Sydenham to make it a bit more exciting than just the name? Or would we have a greyhound as well, especially for the pub ? There is the one on the Sydenham Centre. I like the murals in Herne Hill etc by Lionel Stanhope. He's done some great work (alongside other people) in Crofton Park and Brockley. Penge is a riot of street art, some of it really high quality. They are starting to do tours of Penge to see it all. It was tried here in Sydenham but unfortunately, there doesn't seem to be the will or support here to do anything unless it comes from the Sydenham Society and/or our local Labour Party representatives. They seem to be the guardians and drive everything that happens here. I think another group should be formed, hopefully with traders, to drive these sorts of projects. So I agree with you JMLF. £2k would get you something pretty decent. I think it would be good to do something different in Sydenham than what is going on elsewhere though. leenewham wrote: I think another group should be formed, hopefully with traders, to drive these sorts of projects. So I agree with you JMLF. £2k would get you something pretty decent. OK, I'm voting you acting chair. Unless I'm voted down I'm asking you to call an initial meeting of those interested. We could combine it with The Greyhound Opening ... March? Hey keen on this idea, I think they look great! Would definitely support the fundraising efforts. I think it is a great idea. I've been past the Forest Hill walrus a few times and it is well done, also being under the bridge it is somewhat protected from the elements. I just wonder how long a mural would survive on an open wall exposed to all weathers? syd-gal wrote: I think it is a great idea. I've been past the Forest Hill walrus a few times and it is well done, also being under the bridge it is somewhat protected from the elements. I just wonder how long a mural would survive on an open wall exposed to all weathers? Murals last for Decades and age with dignity. I think they actually improve with age. Look at all the advertising signs still painted on walls that are often over 50 years old. I wouldn't worry about how long they last. Enamel panels can look good too. You can paint them so they look aged from the word go. This is one we designed for Bromley Council, it's designed to look aged from the outset. Right that’s decided then - I’m on it! I’m currently in the process of finding out who to contact/contacting network rail regarding the wall as a proposed mural area. As they have given support to other areas in the past, this I imagine would be the simplest (and in my humble opinion probably the best place to have a mural). At least it’s a starting point that can be canned if another location owned by someone else is felt better when we have a meet/get a group going. Once I’ve got a little info going in the right direction I suggest (much like others have) to have a bit of a meeting/chat in a pub regarding thoughts on everything before starting to make decisions on what platform to use to crowdfund, location (if another is wanted), design, cost, size etc and how to promote. I know very little about this sort of stuff but am pretty on it and excited by this and feel it could be something that could be done potentially easily/quick and make a nice little difference so very happy (amongst others I hope) to be involved! Hoping to receive the contact email for the Network Rail guy who signs off on things like this to see if they would in theory and if it’s viable etc. Regardless of if we use any of the above emails/twitter, a network rail owned location or other, or if the whole thing flops (I’d like to think not) just think maybe good to hit the ground running and start something going! I think the bridge itself would be a good site, perhaps within the recessed panels? Different panels could show the different transport methods that have passed underneath. First the canal, then atmospheric railway, then steam and so on up to the Overground trains. I thought it wasn't up yet? That's really strange. There was something there a week or so ago, so it must have been a template or poster or something. I didn't see it clearly as I was always on a bus when I went past. I’ve been in touch with Lionel, the artist who has been doing the murals for areas of South East London, who kindly replied with some general information, questions and the direct contact at Network Rail who I have emailed and am awaiting a reply regarding information for permission of a mural on Network Rail owned walls/bridge (if that is what is decided). I plan to take some photographs of the potential Network Rail locations raised so far to send to both Lionel and Network Rail to see what may be best/acceptable. From some brief information from Lionel I think the bridge may be too small (?) as a preferred option perhaps. He recommended 30ft x 10ft as having the best impact in his opinion. Lionel also requested what potential colours to mock up something to help with discussion and campaign. Just something to vaguely think about as much like the FH mural, I feel opening the floor to other designers and designs (as well as colour schemes) should take place in an as fair way as possible. I’ll post network rail and Lionel’s reply regarding the possible locations in the next week hopefully. Maybe from there we could think about setting up a meeting for discussion and I will travel through the SE23.life forum re: FH mural process and get a better idea of how we can be as fair as possible re: the people of Sydenham having a say in location, designer, design, colours and cost. Do please just respond with thoughts/ideas and if you would like to lead or be involved directly with this as I didn’t intend to and have no experience in this stuff but thought I’d at least get the ball rolling and take the bull by the horns a bit! Your images have to be first uploadede or available elsewhere on the public internet somewhere. Your favourite picture gallery? Then you use the img tags to point to the url (web address) of the picture starting with http ... It will usually end in .jpg or .png. If its embedded in an existing webpage then, with most browsers, rightclick the image and you should be able to open it in a new tab or copy the image (not page) address. 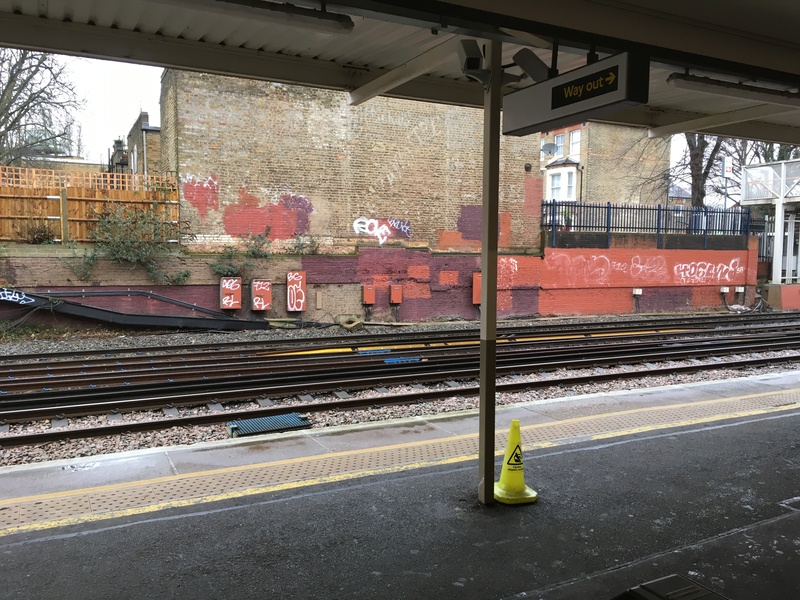 Here are the three Network Rail (assumed) sites put forward by people in the first informal forum discussions (across both Sydenham town forum and se26.life forums). 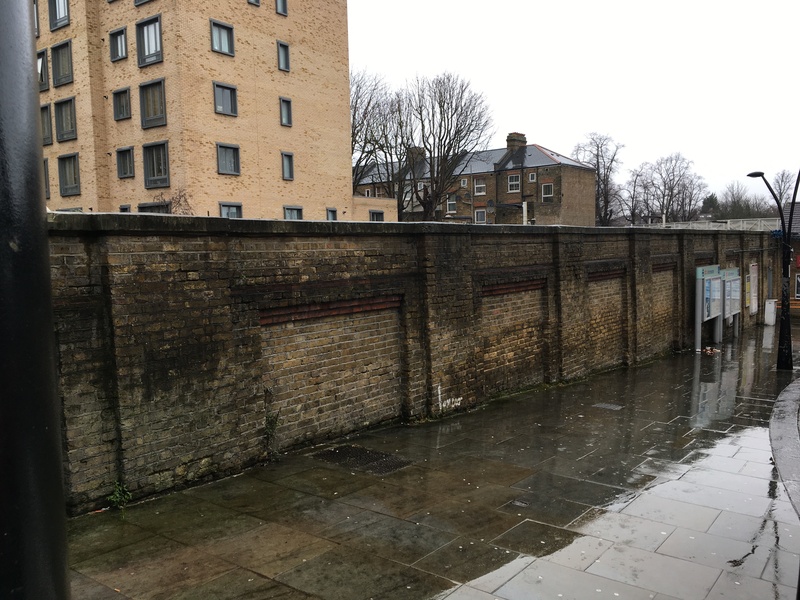 Again, secondary to Network Rail having okayed previous projects in the South East, a piece of wall owned by them is likely easiest to get permission for hence this as a starting point. For that last one (the one facing the south-bound platform) I've just asked my Network Rail employed husband. There is very little chance that you would be allowed to do that if you weren't a railway company with the properly signed off track-side training (I'm paraphrasing, in case any other NR employees query my phrasing! ), as there isn't any non-track access to the site. Plus the timing aspect - even if you could get the trained employees in then you would need to be able to do it on a weekend when the trains weren't running and on average there are 4 or 5 a year of those. So sadly I think that one is a non-starter, which is a shame as it would be a much nicer thing to look at!